A native to Mexico, Central America and the Caribbean this plant appears on the 'Bushland Friendly Nursery Scheme' list of environmental weeds for Coffs Harbour. It is an annual or short-lived perennial herb growing to around 1 metre and is a widespread weed of disturbed areas. Blue billygoat weed has been widely cultivated as a garden ornamental, and in cultivation it is often known as 'floss flower'. There are many different cultivars, which vary in size and flower colour (blue, purple, pink and white flowered). 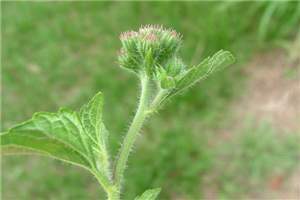 The leaves and stems are softly hairy. Leaves mostly opposite, but sometimes (upper) alternate leaves. Finely serrated, almost triangular to ovate, with either blunt or pointed tips. The stems are quite brittle and break off when weeding leaving the root system behind to regenerate. They have a pungent smell when handled and the plant aggressively self seeds with 2mm long black or brown seeds topped with five whitish, hair-like scales. This weed is problematic for the sugar cane farmers further north and I suspect this is where the seeds came from to germinate in my garden! If you want to spray this weed use *metsulfuron-methyl at 1g/10L with surfactant. This plant is toxic to grazing animals, causing liver lesions as it contains pyrrolizine alkoids. *Metsulfuron-methyl is a selective, translocated herbicide that is mainly absorbed through leaves, though root absorption can occur. 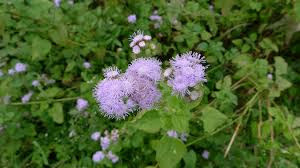 Its main use is for broad-leaved weed control. It is of low toxicity to mammals, birds and fish. Metsulfuron acts on the ALS enzyme in plants which is not present in animals and therefore the main reason for its low toxicity. It presents little hazard in the environment because of its low toxicity and quick degradation.